What is the Difference between the two Twin Peaks: the Entire Mystery Blu-ray sets? The original release includes deluxe packaging and a 10th disc. The new release excludes the deluxe packaging and the 10th disc at a reduced price. Twenty-five years after the shocking murder of Laura Palmer in the acclaimed series from legendary filmmaker David Lynch and writer/producer Mark Frost, CBS Home Entertainment and Paramount Home Media Distribution will release TWIN PEAKS – THE ENTIRE MYSTERY. 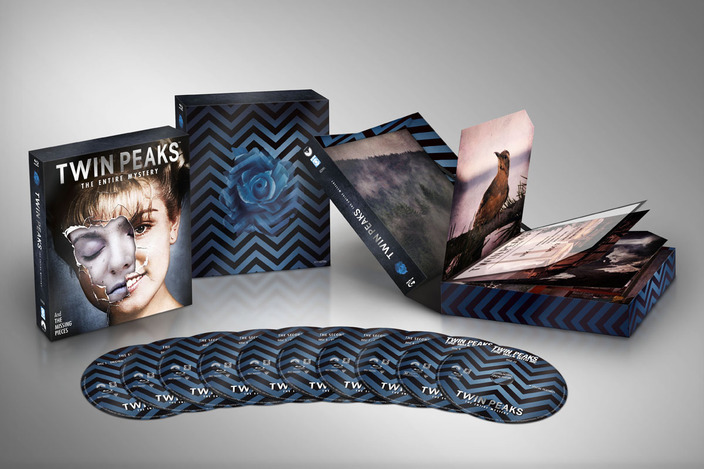 Additionally, the set features a massive collection of pre-existing special features, some of which have been re-mastered in high definition exclusively for this release, including the award-winning four-part documentary “Secrets From Another Place: Creating Twin Peaks,” and a newly extended version of the Gold Box featurette “A Slice of Lynch,” featuring the complete and uncut conversation between David Lynch and actors Kyle MacLachlan and Mädchen Amick. Additionally, this 10-disc set houses an extraordinary archive of special features culled from the entire history ofTwin Peaks on home video, including featurettes, cast and crew interviews, promotional reels, archival deleted scenes…and much, much more. Winning a Golden Globe® for Best Television Series – Drama in 1991, and a fixture in all-time top TV series lists from TIME, Entertainment Weeklyand TV Guide, Twin Peaks follows the inhabitants of a quaint northwestern town who are stunned after the homecoming queen Laura Palmer is suddenly found murdered. The investigation that follows engenders an eerie chain of events with cataclysmic results felt across the entire town. The series features an ensemble cast including Kyle MacLachlan, Michael Ontkean, Sheryl Lee, Sherilyn Fenn, Lara Flynn Boyle, Mädchen Amick, Dana Ashbrook, Richard Beymer, Ray Wise, Peggy Lipton and Warren Frost. Although shot after the series ended, Twin Peaks: Fire Walk With Me is the prequel to the television series and focuses on the seven days leading up to Laura Palmer’s death. Many of the TV series cast members reprise their roles in the film and are joined by others including Kiefer Sutherland, David Bowie, Chris Isaak and Harry Dean Stanton. A Slice of Lynch: Uncut (HD) – NEW! Series Deleted Scenes (HD) – NEW! Between Two Worlds (HD) – NEW! Moving Through Time: Fire Walk With Me Memories (HD) – NEW! Fire Walk With Me Photo Gallery – NEW!